Available for download at itunes, amazon mp3, emusic, napster and rhapsody with a link to these stores. 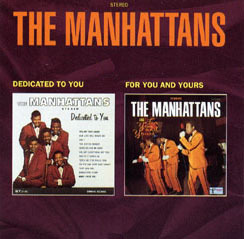 THE MANHATTANS have been on the R&B/Soul scene since 1966. Prior to their Big Hits on Columbia, The Manhattans scored numerous Billboard Top 10 R&B hits on Carnival Records. "Follow Your Heart" "I Wanna Be" "Can I" "I Call It Love" and 20 others are featured on this 2-CD Set.